[OSEN=선미경 기자] “IF YOU”, group BIGBANG’s new song for July, is staying in the No.1 place on music charts for six days in a row. The song released on the 1 of this month is drawing a big popularity, staying in the No.1 place on Melon, Korea’s biggest music-streaming website, as of July 6 at 7am. In addition, it is also being ranked in top places on other major music charts, along with “SOBER”. “IF YOU” is a sad and sentimental song that is different from other BIGBANG songs. G-DRAGON took part in composing and writing the lyrics of the song, while PK who composed BIGBANG’s “MONSTER” and Dee.P who composed TAEYANG’s solo “EYES, NOSE, LIPS” with TEDDY worked on the song for composition and arrangement. A sad BIGBANG in this midsummer is giving fans and the public a fresh entertainment. 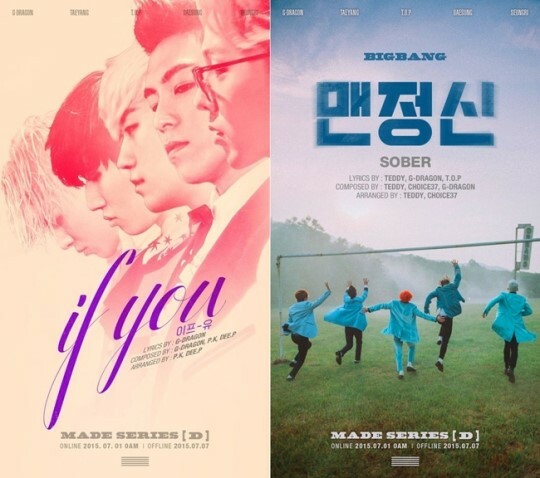 BIGBANG has been carrying out “MADE” project since May, releasing two songs on the 1 of every month. They are conquering the music scene for three months in a row, with “LOSER” and “BAE BAE” released in May and “BANG BANG BANG” and ” WE LIKE 2 PARTY” released in June recording great success successively.